The Enlargement Report 2016 of the European Union severely criticized on Wednesday Turkey as a formal candidate country for backsliding in the areas of rule of law and fundamental rights and damage inflicted on functioning of judiciary and freedom of expression. Reminding Turkey of the democracy standard of the European Union, the report said that there is no ¨Turkish variant¨ of democracy or the rule of law. The EU unequivocally stated that there is only one democracy and one rule of law to be fulfilled by all candidate countries. Amid Turkey’s promise to reinstate death penalty, the EU made it clear that abolition of death penalty is a must for membership criteria. 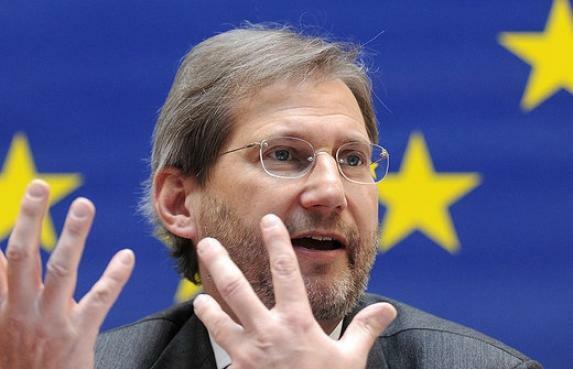 According to Hahn, the report is a ¨wake-up call¨ for member states to start an open discussion about the bloc’s future relationship with Turkey. While acknowledging the difficulties faced by the coup attempt of July 15, the report directed attention to the government’s measures affecting the whole spectrum of Turkish society from the military and the police to university professors, teachers, lawyers and judges, media and all parts of the business community. Despite severe criticisms towards Turkey, the EU appreciates Turkey’s ¨remarkable achievement¨ in the refugee issue. According to the report, EU’s cooperation with Turkey produced ¨tangible results“ dropping the number of migrants heading from Turkey to Greece from 739,000 to 18.000. The EU has already paid 700 million Euros to Turkey out of promised 3 billion of the Facility for Refugees fund. The report also slammed Turkey for the worsening situation in the southeast while calling for a political solution to the Kurdish issue. Criticizing the counter-terrorism law, the EU states that this legislation must be changed to make sure it is not used against journalists, academics and the opposition.